Before my wedding, I did not care too much for flowers. Sure, they were pretty and sure, I knew the names of a few varieties. But they just weren’t my thing. So when I kept seeing signs and advertisements for a local tulip festival last year, every day as I traveled to and from work, I was not sure if I would even check it out. How long could one stare at flowers, and how fun could that possibly even be? Fast forward a year and I am obsessed with flowers. From planning our flower garden, to bringing home and arranging fresh flowers, and from carefully pruning hostas to seeking out all the cherry blossoms I can find in the city, I now have a full fledged love affair with flowers. My love bloomed (see what I did there?!) choosing and seeing the amazing floral arrangements at my wedding come to life. If I’m being totally honest though, the Chilliwack Tulip Fest is where it all started. Tulips of The Valley is just one of the many annual tulip festivals located in the Pacific Northwest. Located in Chilliwack, BC, in the heart of the Fraser Valley, it is the largest of its kind in Western Canada, at 20 acres. It usually runs during the month of April, with a chance for early an early opening or late close, based on the temperment of the flowers. Looking for Winter activities in Canada? Check out my Best Winter Destinations in the Canadian Rockies post! On their website you can find detailed information, including rates, how to get there, and the history of the festival. They also have an Instagram page where you can see the blooms, and where they feature photos from other users (fun fact: they featured my photo last year!). One thing I really enjoyed was taking advantage of the discounted days they provide to the community. 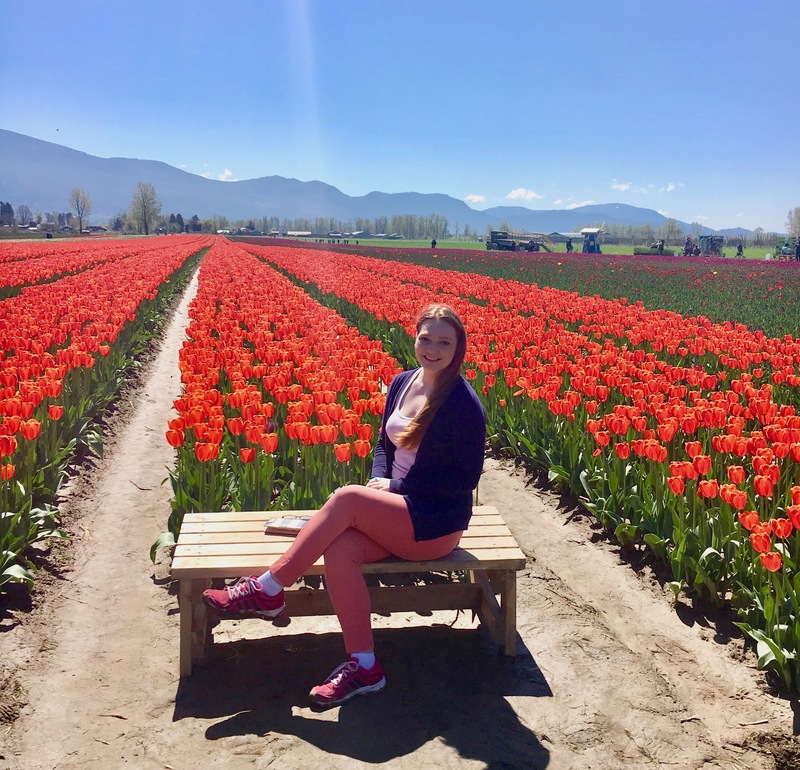 This year they are calling it “Local Thursdays”, where members with proof of a Chilliwack adress can enjoy the flower fields for half the price (not available online, walk up only). For more special tickets and discounted rates, visit their Rates Page. I visited on a sunny day, so one would reasonably expect that regular running shoes would cut it. Nope. Remember, these are real farm fields and to get between tulips you have to walk on muddy paths. Within the first few minutes it was quite clear that I had not put too much thought into my footwear. I was able to dodge puddles and tiptoe through mud, but others were not as lucky. There were some visitors in sandals, and even one or two in high heels. By the end of the fields my pink shoes were completely brown, so I cannot imagine what became of their fancy footwear. Even on the sunniest of days, there is probably mud. The climate of the Pacific Northwest is known for its rain, and even if it is not raining the day you visit, it probably rained the day before or will rain the day after. If I could do it all again, I would wear rain boots. Splishing and splashing through the mud in cute rain boots to get to the tulips is probably a lot more endearing than avoiding certain parts of the path like the plague, and also probably makes you look like less of an amateur. After making it through the beautiful red tulips (which are unbelievably bright) I moved through the mud to get to the area of the fields that would have the closest mountains in the backdrop. Chilliwack is basically surrounded by mountains, and being an Ontario girl mountains never cease to amaze me. As I made my way around to view tulips in all sorts of different colors, I realized I was swatting an awful lot. There were small clouds of gnats following me it seemed. This was fine, until it was not. As I got closer to the end of the tulips, the clouds intensified. They were no longer following me, I was walking straight through them. And there was no escape but to keep pushing through the gnats, unless I wanted to turn around and walk all the way back through the fields. I must have looked ridiculous as I pulled my cardigan up over my chest and face. I wish I were kidding, but the clouds of gnats were so intense that they started to fly down my shirt, into my hair and all over my face. As I rushed through the last tulips I could barely see, and spent a good few minutes removing gnats from myself after I had escaped. I was lucky that I went during a time when many of the tulips were in bloom, but when I looked at pictures a few weeks later I realized that I had missed full bloom. Although the festival usually runs the month of April, it does not mean that from April 1st- April 30th you will be walking amongst colorful fields. Some years the flowers bloom early. Some years it takes until the end of the month for the full colors to show. Tulips do not conform to the schedule of the festival, and it is not guaranteed that you will see the fields in full bloom. The best way to decide when to go is to check for updates on their website. They regularly provide blooming updates with a bloom chart. A new feature this year is that they have new flowers for viewing in their fields: daffodils and hyacinths. Because these flowers all bloom at slightly different times, it ensures that you will not be disappointed when visiting if the tulips have not completely bloomed yet. I was worried that I would get through the tulips quite fast but this was not the case! The location has on-site food trucks so that you do not need to leave to grab a bite to eat. I had an awesome smoothie from one of their food trucks, and then tasted honey from a local vendor. I was able to buy local clover honey aftertaste tasting a few different kinds. They also have a store with bulbs available, so you can purchase different varieties and then grow your own tulips. Although I had nowhere to grow tulips last year, it is a great option if you have a garden. The Bloom Tulip Festival is located in Abbotsford, a neighboring city to Chilliwack. Skagit Valley Tulip Festival is located about an hour and a half North of Seattle,WA. This festival is different from the others because it features multiple fields. Wooden Shoe Tulip Fest is located about an hour South of Portland, OR. These fields probably have the best backdrop, with Mt. Baker in the distance. One thing that I really like about the festivals in British Columbia & Oregon is that they allow leashed dogs in the fields. As a dog mom, I can imagine the cool photo opportunities one could have here with their four legged friends! If you have some time and will either be visiting the area or live in the area, check out one of the tulip festivals in the Pacific Northwest. Your camera roll and your eyes will not be disappointed! Thanks so much! The flowers were beautiful! Thank you so much for sharing this! My daughter keeps asking to see tulips, this would be the perfect place to take her! Pinned this too! It would be perfect! It is a great activity for all ages, I hope you get to see them! I’m speechless. They’re totally beautiful. I’ve only been to a tulip garden, I had fun looking at how gorgeous looking these flowers are. But I bet it’s a whole new level in a tulip festival. They are so beautiful! They were not quite in full bloom but I have heard that when they are it is absolutely breathtaking! Oh my gosh, those pictures are amazing! Thanks so much! The tulips did all the work! Thanks! They were very lovely flowers! Your photos are so vibrant! Love it! Thanks so much! I didn’t do much work, it was all the flowers! Holy, WOW! I wish it was this beautiful out when I went to our tulip festival! Alas, it was pouring rain the whole photoshoot. But the flowers were equally as beautiful. Your shots are so stunning! That backdrop is even magnificent! Thank you for sharing, lovely! Oh no! I was really lucky it was not raining when I went, I went to the WA festival yesterday & it was all muddy and rainy. Thanks for reading! Wow, a real eye-feast. If I could be there, I couldn’t stop clicking pictures. Thanks for sharing! I had a hard time putting my camera down to really appreciate the flowers, because they’re so magnificent! Thanks for reading! OMG, those tulips are so incredible and massive! I would love to visit this place one day! They were pretty awesome! They were a lot bigger than I expected. I hope you get a chance to visit!!! WOW! This is amazing! I would love to visit this tulip festival one day. That’s so cool you can let your pup run too. It is cool! I don’t know if I would trust my dogs running amongst flowers but for calm and well behaved dogs it would make for an awesome photoshoot. I hope you get a chance to visit! These photos are absolutely beautiful! There is a tulip festival in Ottawa as well; however I don’t think it’s to the same extent as this! Thanks for sharing. I remember that there is one in Ottawa (I am originally from Toronto). It would be interesting to see pictures to see how it compares! Thanks for reading! OMG this is so beautiful! Tulips are my absolute favorite. This is on my bucket list for sure. Tulips have become my favorite thanks to the festival! Ties with hydrangeas! Hope you get to see them soon! Looks like a wonderful place to visit (minus the gnats). So beautiful. Will have to add to my bucket list. Thanks so much for sharing this adventure with us. If you can escape the gnats it is lovely! I hope you can visit the tulips soon, they are even prettier in person! Holy cow, I love your photos! It’s so nice to discover these local things, and the tulips look totally worth it. Thanks so much! My new favorite thing is discovering local things, there is so much to see where you live and I prefer not having to take an airplane to see things! How fun!!! Those pictures are just so colorful and striking. I have lived in the PNW for a while and completely understand the gnat problem. Those little guys are crazy! Thanks! The flowers were extremely vibrant! Ugh, gnats are the worst. They strike at the most unexpected times and always catch me off guard! I didn’t know either until I saw signs last year! It was a great day, despite the pesty gnats. Thanks for stopping by!